We love a bit of attitude in our own clothes, so of course we appreciate these tongue-in-cheek pieces for boys from miniMonster. Striped knit rompers with tough bulldogs appliques. 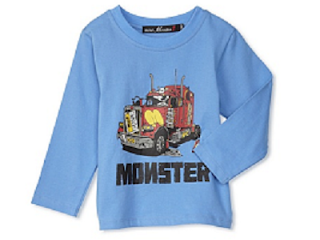 Long sleeve tees with monster trucks. Your little one may not know The Clash yet, but it's never too early to introduce punk flair into his wardrobe.